This lab will go through the different steps needed to configure an HA Kubernetes cluster on VMware vSphere manually. The various communications between the Kubernetes components will be secured with TLS. If you are used to deploy Kubernetes with tools like kubeadm but would like to understand a bit more what is going on under the hood, this tutorial is for you. However, it is good to have an understanding of the architecture of each Kubernetes node as described in the Kubernetes components documentation. 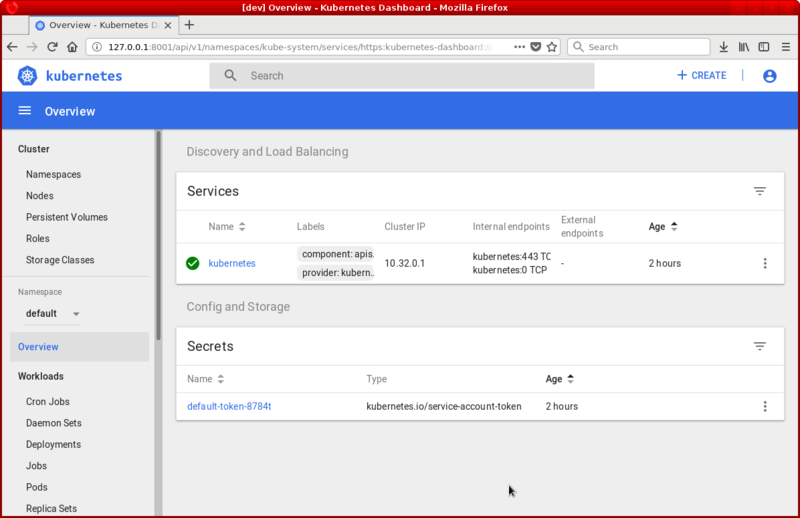 This article is inspired by the awesome tutorial Kubernetes the hard way, which explains how to deploy a Kubernetes cluster from scratch on Google Cloud Platform. Some of the steps are a bit different on VMware vSphere. For example, VMware vSphere doesn't provide a native load balancer and we will have to install and configure one ourselves. For this lab, we will use a standard Ubuntu 16.04 installation as a base image for the seven virtual machines needed. The virtual machines will all be configured on the same virtual network 10.10.40.0/24 and this network needs to have access to the Internet. The first machine needed is the machine on which the HAProxy load balancer will be installed. We will assign the IP 10.10.40.63 to this machine. We also need three Kubernetes master nodes. These virtual machines will have the IPs 10.10.40.60, 10.10.40.61, and 10.10.40.62. Finally, we will also have three Kubernetes worker nodes with the IPs 10.10.40.70, 10.10.40.71, and 10.10.40.72. We also need an IP range for the pods. This range will be 10.20.0.0/16, but it is only internal to Kubernetes and doesn't need to be configured on VMware vSphere. I will use my Linux desktop as a client machine to generate all the necessary certificates, but also to manage the Kubernetes cluster. If you don't have a Linux desktop, you can use the HAProxy virtual machine to do the same thing. We will need two tools on the client machine. The Cloud Flare SSL tool to generate the different certificates, and the Kubernetes client, kubectl, to manage the Kubernetes cluster. 1- SSH to the 10.10.40.63 Ubuntu virtual machine. 2- Update the virtual machine. These steps can be done on your Linux desktop if you have one or on the HAProxy virtual machine depending on where you installed the cfssl tool. Each Kubernetes component will need a client and a server certificate to communicate over TLS. We will generate all these certificates in this section. This certificate will be used to connect to the Kubernetes cluster as an administrator. 2- Generate the certificate and the private key. 3- Verify that the admin-key.pem and the admin.pem were generated. We will deploy a kubelet on each Kubernetes worker node. Each of these kubelets will need a certificate to join the Kubernetes cluster. 1- Create a certificate signing request configuration file for the 10.10.40.70 worker node. 3- Create a certificate signing request configuration file for the 10.10.40.71 worker node. 4- Generate the certificate and the private key. 5- Create a certificate signing request configuration file for the 10.10.40.72. 6- Generate the certificate and the private key. 7- Verify that the files 10.10.40.70-key.pem, 10.10.40.70.pem, 10.10.40.71-key.pem, 10.10.40.71.pem, 10.10.40.72-key.pem, and 10.10.40.72.pem were generated. Another component that we will install on all our worker nodes is the kube-proxy. 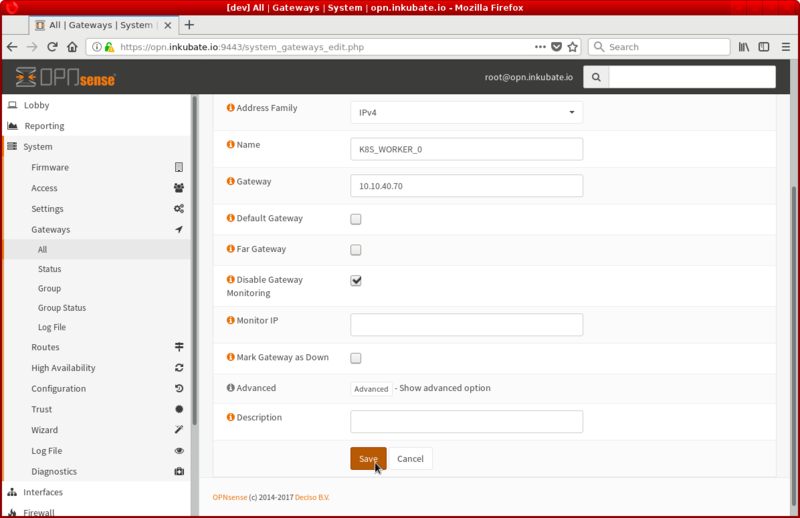 The kube-proxy also needs a client certificate. 2- Generate the kube-proxy certificate and private key. 3- Verify that the kube-proxy-key.pem and the kube-proxy.pem files were generated. The last certificate we need to generate is the API server certificate. The API component will be installed on each of our Kubernetes master nodes. 2- Generate the API server certificate and private key. 1- Copy the certificates to the 10.10.40.70 worker node. 2- Copy the certificates to the 10.10.40.71 worker node. 3- Copy the certificates to the 10.10.40.72 worker node. 1- Copy the certificates to 10.10.40.60. 2- Copy the certificates to 10.10.40.61. 3- Copy the certificates to the 10.10.40.62. We need to configure the kubelet and the kube-proxy with a kubeconfig file on each worker node to allow them to access the Kubernetes API. 1- Add the cluster information for 10.10.40.70. 2- Add the credentials for 10.10.40.70. 3- Add the context for 10.10.40.70. 4- Use the context for 10.10.40.70. 5- Add the cluster information for 10.10.40.71. 6- Add the credentials for 10.10.40.71. 7- Add the context for 10.10.40.71. 8- Use the context for 10.10.40.71. 9- Add the cluster information for 10.10.40.72. 10- Add the credentials for 10.10.40.72. 11- Add the context for 10.10.40.72. 12- Use the context for 10.10.40.72. 1- Add the cluster information. 3- Add the context information. 1- Copy the configuration to 10.10.40.70. 2- Copy the configuration to 10.10.40.71. 3- Copy the configuration to 10.10.40.72. Kubernetes is able to store secrets for us in a key value store. To encrypt this data before storing it, we need an encryption key. 1- Generate a random encryption key. 2- Create a Kubernetes manifest for the encryption configuration. 3- Copy the manifest to 10.10.40.60. 4- Copy the manifest to 10.10.40.61. 5- Copy the manifest to 10.10.40.62. One of the main components of the master nodes is the etcd cluster. Etcd is a key value store and is used to store the Kubernetes cluster state. We are going to configure one etcd node per master. With this configuration, the Kubernetes cluster will still be available if one of the etcd fails. 1- SSH to the 10.10.40.60 virtual machine. 2- Download the etcd binaries. 3- Extract the etcd archive. 4- Move the etcd binaries to /usr/local/bin. 5- Create the configuration directories. 6- Copy the certificates to the /etc/etcd configuration directory. 1- SSH to the 10.10.40.61 virtual machine. 1- SSH to the 10.10.40.62 virtual machine. The Kubernetes master nodes need to run three other components: the API, the controller manager, and the scheduler. We will also install a Kubernetes client, kubectl, on each node. 3- Add the execution permissions to the binaries. 4- Move the binaries to /usr/local/bin. 5- Create the API configuration directory. 6- Copy the certificates to the API configuration directory. 7- Create an API systemd unit file. 8- Create a controller manager systemd unit file. 9- Create a scheduler systemd unit file. 10- Reload the daemon configuration. 11- Enable the services to start at boot time. 13- Verify the different components. We need to configure each API server to be able to access the kubelet running on each worker node. To achieve this, we need to create a cluster role. 1- SSH to the 10.10.40.60 master node. 2- Create a Kubernetes manifest file kube-apiserver-to-kubelet.yaml. 4- Create a manifest file to bind the cluster role to the kubernetes user used by the API server. At this point, you should be able to access the API server through the HAProxy load balancer. The Kubernetes worker nodes need to run various components. 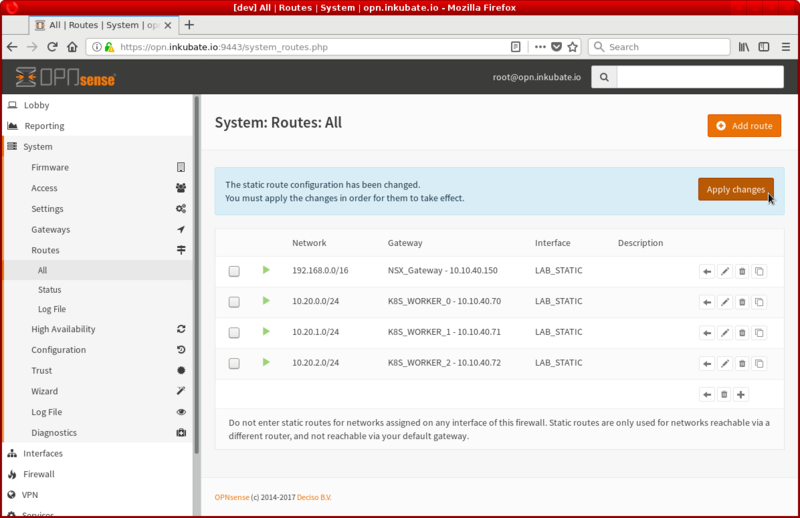 We will install the cni plugin, cri containerd, the kube-proxy, the kubelet, and the kubectl client on each nodes. 2- Disable the swap as the kubelet refuses to start with the swap enabled. 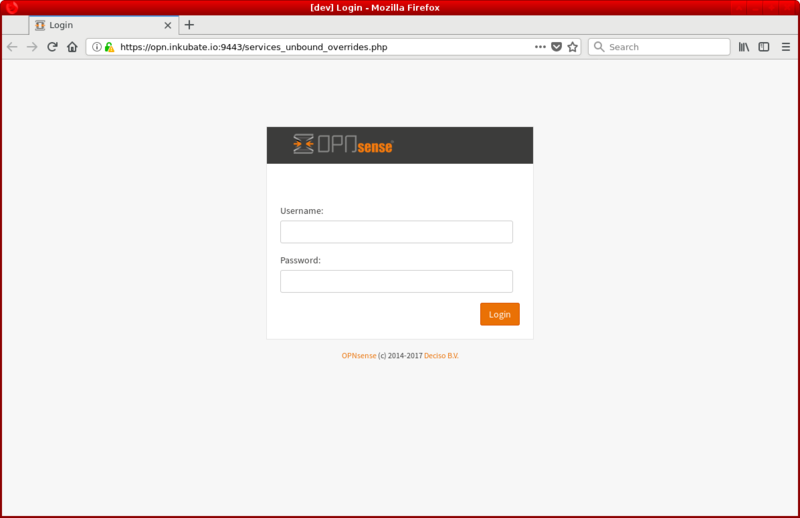 3- Modify the hostname to match the IP. 4- Update the virtual machine. 5- Install socat. Socat is a dependency of the kubectl port-forward command. 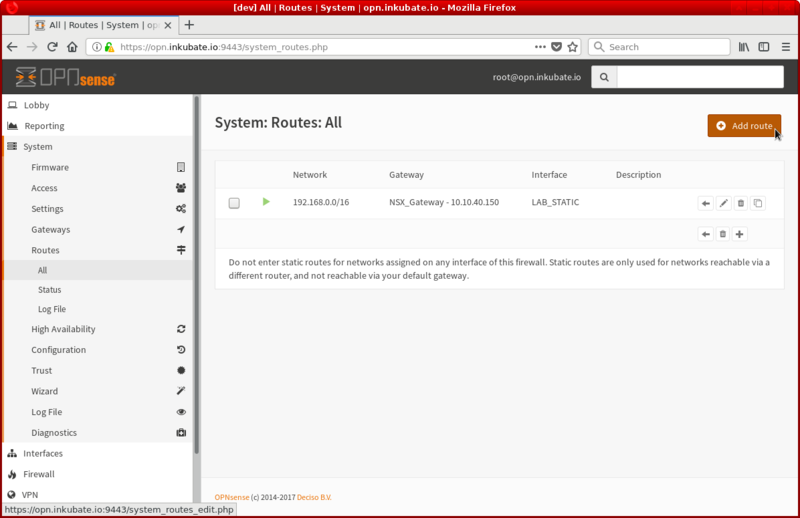 The port forwarding will not work if you don't install socat. 7- Create the installation directories. 8- Install the binaries in their respective directory. 9- Configure the CNI networking. 11- Create the kubelet systemd unit file. 13- Create the kube-proxy systemd unit file. 14- Reload the daemon configuration. 15- Enable the services to start at boot time. 2- List the worker nodes. The three worker nodes should be listed and in a ready state. We need to create a kubeconfig file on the client machine to be able to manage the Kubernetes cluster with kubectl from this machine. 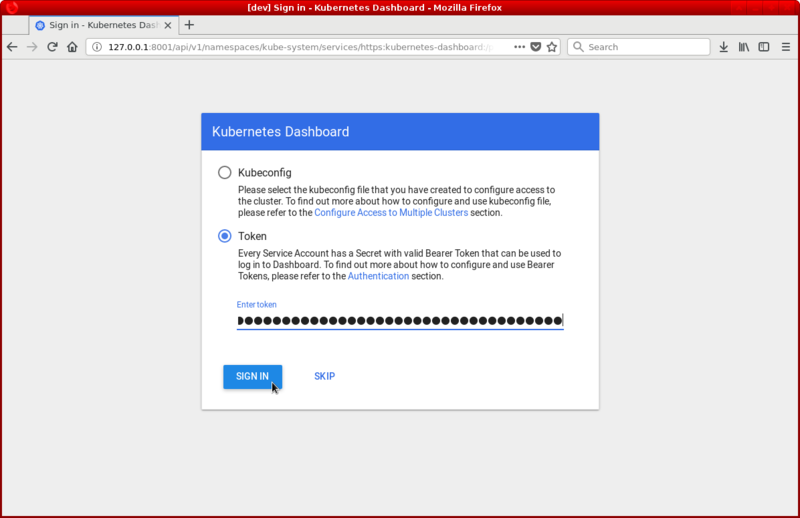 5- Verify that you can access the Kubernetes cluster from the client machine. The kubernetes cluster is now up and running, but we still have one issue to solve. Each worker node uses a different network to assign an IP to the pods. It means that two pods located on two different worker nodes cannot communicate between them. To solve this issue, we need to configure static routes on the gateway of the network 10.10.40.0/24. In my case, the gateway is 10.10.40.1 and is an OPNSense server. If you don't have access to your network gateway, you can still solve this problem by creating an overlay network for the pods with something like flannel, weave net, or calico. 1- Login to your OPNSense gateway. 2- Add 10.10.40.70 as a new gateway. 3- Add 10.10.40.71 as a new gateway. 4- Add 10.10.40.72 as a new gateway. 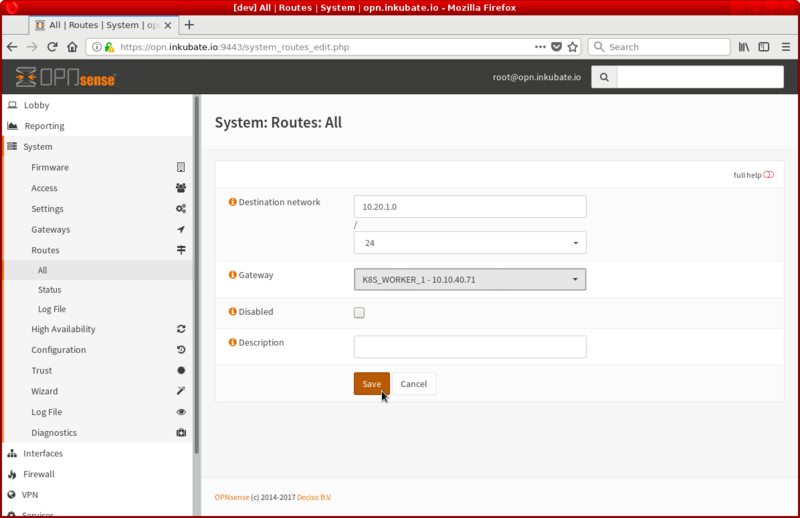 6- Create a new route for the pods running on 10.10.40.70. 7- Create a new route for the pods running on 10.10.40.71. 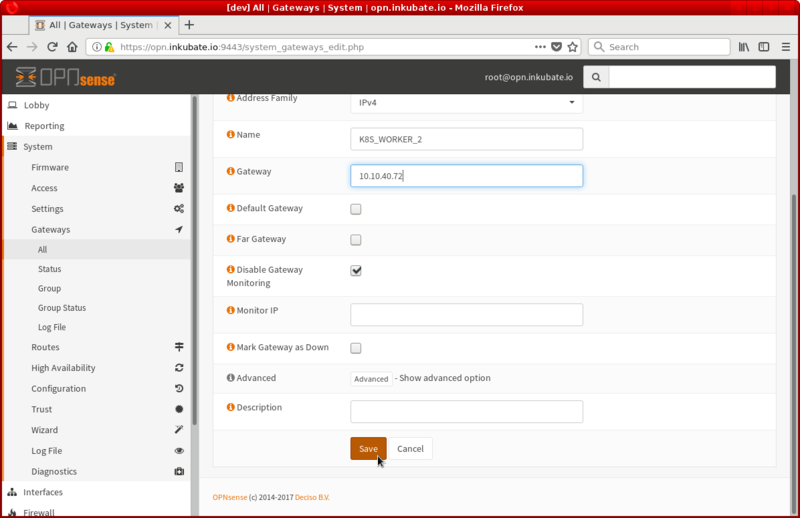 8- Create a new route for the pods running on 10.10.40.72. We will deploy three Kubernetes add-ons on our new cluster. The kube-dns add-on which provides a DNS based service discovery for the pods running in the cluster, the dashboard add-on to have a graphical view of the cluster and the Heapster add-on to monitor our workload. 1- Create the kube-dns manifest. dnsPolicy: Default  # Don't use cluster DNS.